NetworkThermostat, a leading communications-based thermostat manufacturer since 1995, is proud to announce the release of their 5th generation platforms for their Net/X™ Wi-Fi and Ethernet smart thermostats. These new platforms feature a multi-level blue backlit display with secondary display for reading remote sensor data and larger easier to read numeric digits on the main display. Like all NetworkThermostat products, the Gen 5 platforms can be added seamlessly to existing NetworkThermostat projects. With NetworkThermostat, there is no compromise when choosing how to access your HVAC controls. Select between Local Area Network access via the Net/X PC software and/or remote access using a direct connection or cloud connection. Net/X’s exclusive DirectConnect™ method allows users to make a direct connection to the thermostats from anywhere on site or remotely, with no need for a ‘cloud’. This is very popular for customers who have security requirements that prevent them from ‘going to the cloud’. With the addition of the CloudConnect™ platform, NetworkThermostat customers have a choice. Both methods can be used simultaneously with the Net/X-IP PC Command Center software for unparalleled connectivity options. 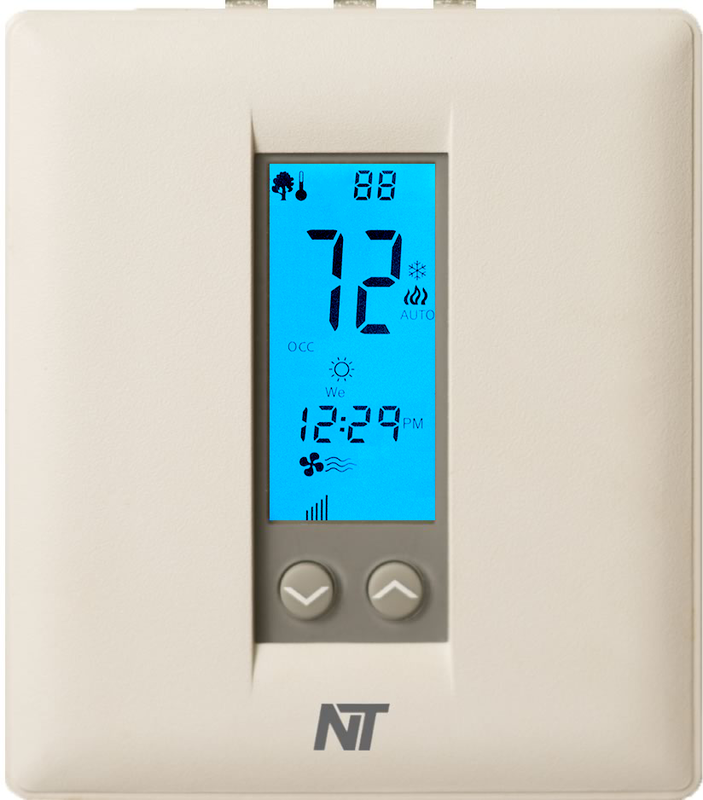 NetworkThermostat’s approach to smart thermostats integrates all of the web pages, schedules, date and time settings, alerts, passwords, network settings and notification destinations directly into the thermostat. The thermostats reside on the Local Area Network using Wi-Fi (UP32x/RP32x-WIFI thermostat) or Ethernet (UP32x/RP32x-IP thermostat). End users and support personnel can connect simultaneously to the thermostats using their favorite PC, Mac, tablet, or smart phone. All eight (8) models of the UP32x/RP32x smart thermostats include all methods. Flexibility is at the heart of every Net/X smart thermostat. All UP32/RP32 thermostats control conventional Gas/Electric (2H/2C) and Heat Pump (3H/2C) systems and the UP32H/RP32H can also manage humidifiers/dehumidifiers and/or fresh air dampers. A lockout feature limits temperature overrides to ±3ºF or ±5°F and includes an adjustable override timer. Use the recirculation fan timer to optimize airflow within the conditioned environment. Integrated real time weather forecasts, based on local zip code, eliminate the need for outdoor sensors when setting heat pump balance points. Special algorithms even lessen energy usage peaks by minimizing the number of HVAC units that can turn on at the same time. The UP32x also supports auxiliary inputs and sensors. Picture a miniature energy management system in a thermostat. Each UP32x supports occupancy sensing, two (2) digital inputs for condensate switch, dirty filter or other fault condition, and an advanced remote sensor bus. The enhanced, fifth generation 3-wire remote sensor bus supports fourteen (14) sensors with up to twenty-five (25) alerts. Remote sensors can be used for room temperature averaging, return and supply air monitoring or even commercial freezer, refrigerator or cooler monitoring. Use associated alerting features to receive notifications when monitored sensors are outside of preset ranges. All thermostat platforms support up to four (4) email and text message destinations for sending reminders and condition alerts to both customer and service personnel. Simply enter the desired alert email addresses and phone numbers in the embedded secure email client. Critical Alerts can be repeated until the alert condition is corrected and reset. These alerts include humidity levels, filter change reminders and a powerful Inefficient Equipment Run alert.